At the end of the Shabbat day, when three stars appear, it is time for the brief ceremony of Havdalah (literally, separation or distinction), at which time we take leave of Shabbat. Scroll down for complete text of Havdalah blessings, Havdalah songs and videos demonstrating how to make Havdalah! Our rabbis teach that on Shabbat, we are given an extra soul. At Havdalah we relinquish that extra soul, but hope that the sweetness and holiness of the day will remain with us during the week. We take a cup of wine, a box of spices and a beautiful braided Havdalah candle, and we sing or recite the blessings. Note: Havdalah sets and Havdalah candles can be purchased at Judaica stores and on Amazon.com. However, a kit is not necessary; a Kiddush cup and any container filled with spices will do. Any fragrant and pleasant-smelling spices can be used. 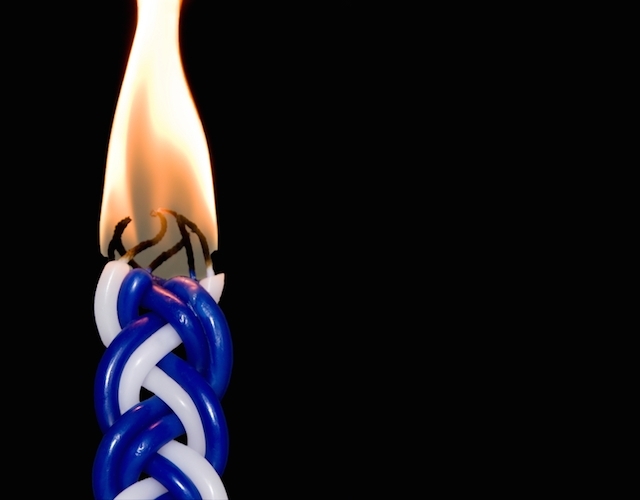 If you cannot find a braided candle, use two regular candles and hold the wicks together. 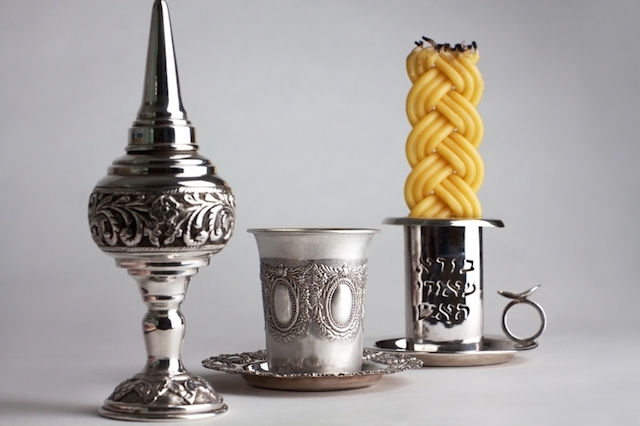 A Havdalah set consists of a spice box, kiddush cup and braided candle. These blessings talk about distinctions between the holy and the everyday, between light and darkness, between the people Israel and the other peoples of the earth, and between the seventh day of rest and the six days of work. We then make a blessing over the wine, a symbol of joy, to sanctify the moment, and we sniff the spices to carry the sweet spice of Shabbat into the week and to wake us gently to our earthly responsibilities. Then we use the light of the candle by looking at our fingernails and palms in the light with our hands palms-up, making finger-shadows on our hands that display the distinction between light and darkness. This light is the first fire of the new week. It is a sign that the time to begin creating again has arrived. No more dreamlike days until next week. It is now time to invest ourselves in our work again. As we make the transition back to our week, we also make the connection between creation and the messianic era (a time of justice and peace) by invoking the prophet Elijah. Tradition teaches that he will herald the coming of the Messiah. Some add that Miriam the prophetess will lead the Jewish people in joyful song and dance to a time of perfection. We then drink the wine, douse the candle, and wish each other a good week. 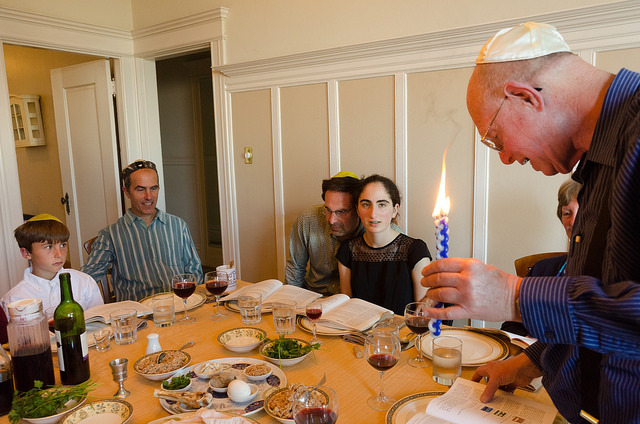 Shabbat is a taste of that perfection, but our work in the world is needed to bring it about. A Havdalah candle has multiple wicks and is lit after the conclusion of Shabbat. To make Havdalah, a braided candle, a spice box filled with spices, and a kiddush cup for wine or grape juice are needed. Form a circle in a fairly dark room and have different people hold the candle, the spice box, and the kiddush cup. The Havdalah blessings are recited in Hebrew or English, either by one person or all together. As each blessing is said, the relevant item is made accessible to the group: The kiddush cup is held up for all to see, but the wine is not sipped yet. The spices are passed around, and each person takes a moment to smell their sweetness. The candle is held high, and every person puts a hand up into the candle’s light, turning the hands over, palms in, and bending the fingers. Some people look into the eyes of those near them to see the light reflected there. When the blessings are concluded, each person takes a sip from the wine. The remainder is poured into a nonflammable dish or basin in which the candle is then extinguished. An alternative, which is more fun but also more dangerous, is to pour whiskey or vodka into the dish and extinguish the candle in it. It will burst into a big, quick burning flame, sure to enchant the children. Hinei El yeshu’ati, evtach v’-lo efchad. Ki ozi ve-zimrat Yah Adonai, vayhi li liyshu’a. Ush’avtem mayim b’sason mi-ma’y’nei ha-yshu’a. L’Adonai ha-y’shu’a, al amkha virkhatekha selah. Adonai tz’vaot imanu, misgav lanu Elohei Ya’akov selah. Adonai tz’vaot ashrei adam boteakh bach. Adonai hosheea, ha-Melech ya’aneinu b’yom kor’einu. La-Yhudim hayta orah ve-simcha ve-sason viykar, ken tihyeh lanu. Kos yeshu’ot esa uvshem Adonai ekra. Behold, God is my unfailing help; I will trust in God and will not be afraid. God is strength and song, my Deliverer. With joy shall you draw water out of the wells of salvation. God alone is our help; may God bless His people. God of the universe is with us; the God of Jacob is our protection. There was light and joy; gladness and honor for the Jewish people. So may we be blessed. I will lift the cup of salvation and call upon God’s Name. Barukh ata Adonai, Eloheinu Melekh ha-olam, borei peri ha-gafen. Barukh ata Adonai, Eloheinu Melekh ha-olam, borei minei v’samim. Blessed are You, Adonai our God, Ruler of the universe, Creator of many kinds of spices. Barukh ata Adonai, Eloheinu Melekh ha-olam, borei m’orei ha-eish. Blessed are You, Adonai our God, Ruler of the universe, Creator of the fire’s light. Barukh ata Adonai, Eloheinu Melekh ha-olam, ha-mavdil bein kodesh l’chol, bein or-le’choshekh, bein Yisrael la-amim, bein yom ha-shevi’i l’sheshet y’mai ha-ma’aseh. Barukh ata Adonai, ha-mavdil bein kodesh l’chol. Blessed are You, Eternal our God, Ruler of the universe, Who distinguishes between the sacred and the profane, between light and darkness, between Israel and other people of the world, between the seventh day and the six days of the week. Blessed are You, Who distinguishes between the sacred and the profane. Eliahu ha-navi, Eliahu ha-Tishbi, Eliahu ha-Giladi. Bimheira v’yameinu yavo eleinu, im mashiach ben David. Miriam ha-Nevi’a, oz v’zimra b’yadah. Miriam tirkod itanu l’hagdil zimrat olam. Miriam tirkod itanu l’taken et ha-olam. Bimheira v’yameinu, hee t’vi’einu el mei ha-y’shua. El mei ha-y’shua. May Elijah the Prophet come to us, heralding the Messiah, soon and in our days! Miriam the Prophetess, strength and song in her hand, will dance with us to repair the world. Soon, and in our days, may she bring us to the waters of redemption! Finally we wish each other a happy, healthy week — “Shavua tov!” — and the lights are turned on. Shabbat has ended. Reprinted with permission from Jewish Family and Life: Traditions, Holidays, and Values for Today’s Parents and Children, published by Golden Books.